The Sun is set to "flip upside down" within weeks as its magnetic field reverses polarity in an event that will send ripple effects throughout the solar system. 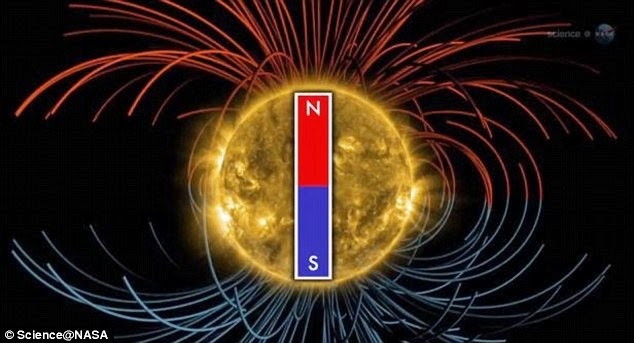 The Sun switches its polarity, its magnetic north and south, once every 11 years. Although it may sound like a catastrophic occurrence, there's no need to run for cover. The sun switches its polarity, flipping its magnetic north and south, once every eleven years through an internal mechanism about which little is understood. Nasa said in August that the change would happen in three to four months time, but it is impossible to give a more specific date. Scientist won't know for around another three weeks whether the flip is complete. The impact of the transfer will be widespread as the sun's magnetic field exerts influence well beyond Pluto, past Nasa's Voyager probes positioned near the edge of interstellar space. The event will be watched closely by researchers at Stanford University's Wilcox Solar Observatory, which monitors the sun's magnetic field on a daily basis. The polarity change is built up throughout the eleven year cycle through areas of intense magnetic activity known as sunspots which gradually move towards the poles, eroding the existing opposite polarity. Eventually, the magnetic field reduces to zero, before rebounding with the opposite polarity. "It's kind of like a tide coming in or going out". "Each little wave brings a little more water in, and eventually you get to the full reversal." One of the most noticeable effect on Earth will be a boost in the occurrence, range and visibility of auroras - the Northern Lights. "It's not a catastrophic event, it's a large scale event that has some real implications, but its not something we need to worry about".